Hidden deep in the recesses of early cinema lies a rarely seen, obscure gem that might be described as something resembling a Max Beckman Moving Picture. Roscoe Arbuckle’s 1916 He Did and He Didn’t is a humorous, expressionistic nightmare which not only calls to mind the texture and atmosphere of Max Beckman expressionist paintings, but also, in heroine Mabel Normand, evokes Edvard Munch as well. Arbuckle had been shifting away from the frantic style of the Mack Sennett factory towards more character driven comedy, and had taken over writing and directing his own films and making features long before Chaplin, Keaton and Lloyd followed suit. He Did and He Didn’t uniquely stands out even among the later Arbuckle films, which is saying quite a bit as Arbuckle was innovative both as a performer and director. His perfectionism was well known and he might very well have earned the crown for king of multiple takes, although the gracefulness he displayed on both sides of the camera never even remotely hints at such perfectionist standards. Arbuckle has been widely credited for influencing such artists as Charlie Chaplin, Buster Keaton, Oliver Hardy and Curly Howard. His distinct on-screen persona was normally that of a country bumpkin and ladies man. Naturally, every great screen personality needs an equally distinct nemesis. 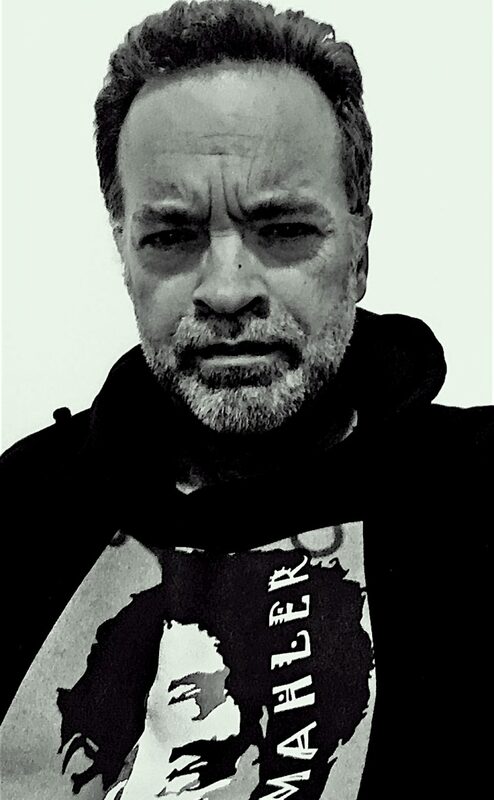 Chaplin had Eric Campbell, Langdon had Vernon Dent, Arbuckle had his Al St. John. The two appeared together in numerous films and, later, Arbuckle directed St. John in Curses (1925) and Bridge Wives(1932). Lanky, bad teeth, bad hair and bad clothes, St. John was Arbuckle’s perfect country bumpkin foil in The Waiter’s Ball (1916), Coney Island (1917) and the recently restored Love(1919), in which Arbuckle donned drag, as he frequently did (Good Night Nurse, an imaginative nightmare fantasy with Keaton, St. John and Arbuckle as a nurse, remains his most memorable drag performance ). Love seems like a charmed, distant cousin to an imagined early Tex Avery cartoon starring John Water’s late star, Divine. Mabel Normand was Arbuckle’s frequent leading lady and possessed an inimitable personality of the pixie girl from the wrong side of the tracks. She was never better than when directed by Arbuckle. She and St. John are on hand forHe Did and He Didn’t, but compared to their other Arbuckle projects, this film has a different quality altogether. Arbuckle, dressed in evening tux, is an upper class doctor and Mabel his much put upon wife. The two are preparing for evening dinner. Arbuckle looks the image of the suave, sinister, cigarette in hand, Beckmanesque figure, ready for a party. Mabel, his pale, thin, dark haired, bug-eyed wife appears to have just stepped out of an angst-ridden Munch canvas. There’s a bit of business about Arbuckle attempting to fasten his bow tie. Mabel offers sympathy, but Arbuckle only makes faces in his mockery of her. She jumps up, asks him to fasten her dress, and sneaks in a kiss as her arms fling around his neck. Disgusted, Arbuckle wipes off the kiss and punches her in the ribs… dress fastened! We are told this is their usual evening and the interplay between two recalls and pre-dates similar domestic strife shows like The Honeymooners. Mabel leaves to fetch the butler so he can assist Arbuckle. Arbuckle smashes his fingers in a drawer. Rube Miller’s saturnine butler arrives to find his master on his knees, rubbing his sore fingers together. Miller assumes Arbuckle is praying and drops to his knees to pray with him. Arbuckle angrily grabs his employee and gives him a swift kick for his error, fairly sacrilegious for 1916. These are ugly, grotesque characters and Arbuckle daringly does not ask, nor does he receive, much in way of audience sympathy. Mabel’s childhood schoolmate, William Jefferson, has come for a reunion and soon jealousy soon rears it’s ugly head. Arbuckle welcomes his wife’s childhood sweetheart to dinner, but then rips up Mabel’s childhood picture. A lobster dinner is served and Mabel exclaims, “we won’t sleep a wink”; prophetic words indeed. Arbuckle is called off to a fake emergency so burglar Al St. John can make his way into the home. This leaves Mabel and Jefferson alone with temptation. Of course, fate will have the upper hand and soon St. John is discovered, leading to predictable frantic mayhem with Arbuckle arriving just in time to find Jefferson putting his wife to bed. 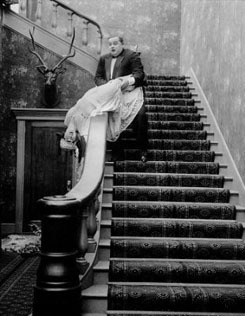 In a rage, Arbuckle throws Jefferson out of the house and strangles his wife, but not before she fires off a shot from a revolver, bringing the giant crashing down the stairwell. Arbuckle knows how to utilize sets and does so here splendidly. The scenes in which Arbuckle strangles his wife and then goes tumbling after being shot by her are nightmarish and disturbingly funny, much more so than the standard Keystone fair. Sexual foreplay, murder, deceit, attempted murder, and dreams are all afoot, making this a standout film for the period. It all turns out to be a bad, shared dream of Arbuckle and Jefferson which they realize as dreamy images of lobsters are superimposed over them. They go to check up on Mabel, who sleeps innocently, having remained true to her Roscoe. Arbuckle smiles knowingly at the camera and bids a suave, devilish adieu as he slowly shuts the door to his wife’s bedchamber, to imagined private delights. He Did and He Didn’t, in it’s characters, atmosphere and tinting feels like a fevered lullaby from the heart of all that is expressionism. Arbuckle and Normand were enormously popular during the period and, even though their characters here are not necessarily sympathetic, it’s easy to relate to 1916 tastes since they possess an undeniable, infectious charm. This film is available on the indispensable The Forgotten Films of Roscoe Arbuckle collection from Mackinac Media. Further recommended viewing: The Arbuckle/Keaton collections from Image and Kino, The Cook from Image, and Normand’s films, Suzanna, What Happened to Rosa, The Extra Girl, and Mickey all from Unknown Video. This entry was posted in BLUEMAHLER'S WORLD OF SILENT CINEMA, Film Reviews and tagged Mabel Normand, Roscoe Arbuckle by Alfred Eaker. Bookmark the permalink.